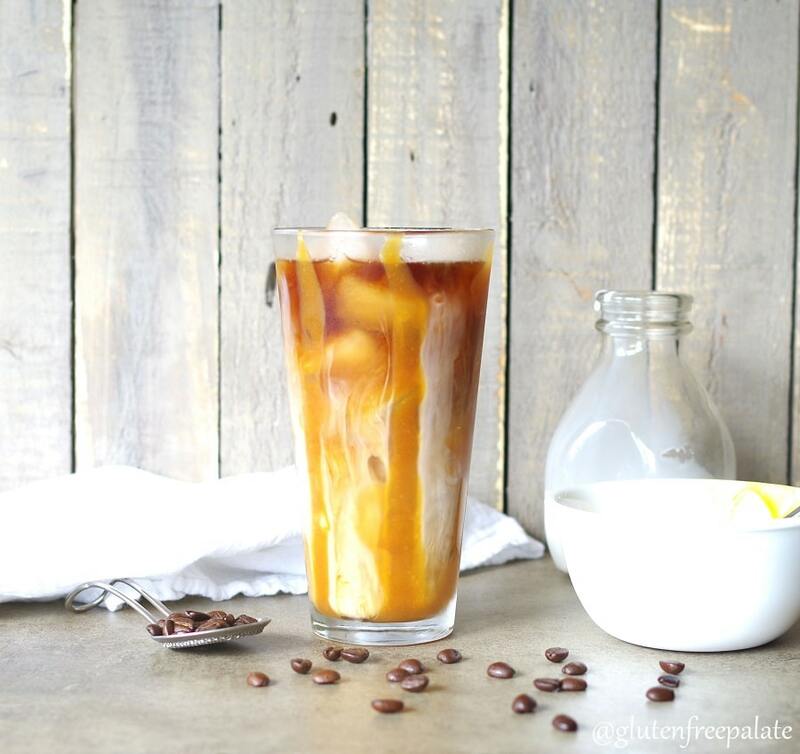 No need to go to your local coffee shop for a good Iced Coffee. 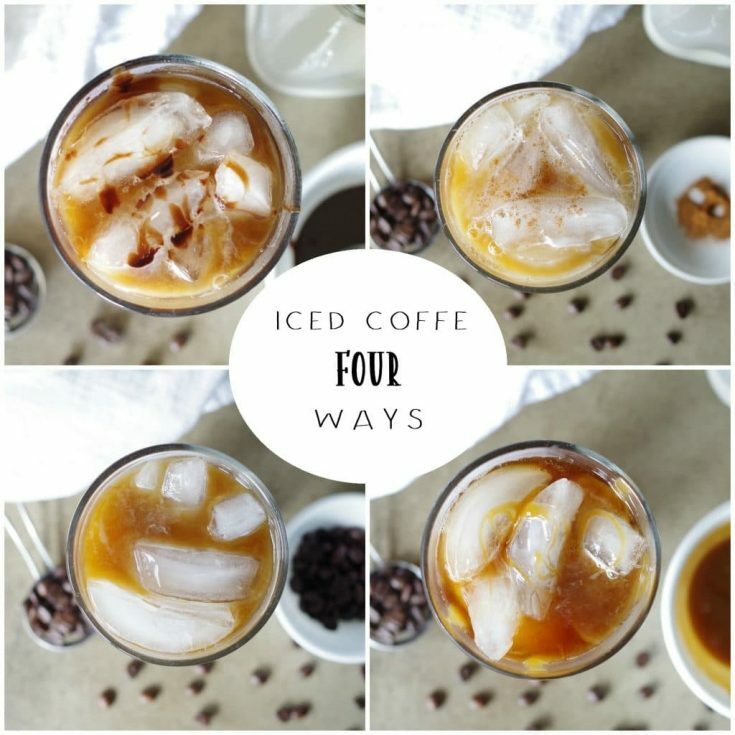 Now you can make Iced Coffee Four Ways at home with a few minutes and some simple ingredients – Traditional Iced Coffee, Dirty Chai Iced Coffee, Salted Caramel Iced Coffee, and Mocha Iced Coffee. A few weeks ago I was grocery shopping at our local health foods store. I was craving an iced coffee like mad and headed straight for the cold drinks section. I found about six different brands of iced coffee. Most of them were loaded with sugar and unhealthy ingredients, with a select few that were actually made with clean ingredients. You’d think that an iced coffee would be coffee and a milk or dairy-free milk. I was surprised to learn that some brands add a bunch of extra stuff. Also, only two brands had a dairy-free version of iced coffee. I opted for one of the dairy-free versions and ended up paying $3 a bottle (and that was on sale). It was quite the treat, but paying that much for a iced coffee stung. I decided to make my own iced coffees four ways at home. I like a variety of flavors. I start with brewed coffee and add in my “flavors” while the coffee is hot. That way the ingredients will dissolve and distribute throughout my coffee evenly. You could start with a cold brew if you wanted, just note that the coconut sugar (and other ingredients) may not dissolve all the way. After I brewed my coffee, I added it to jars and stirred in the ingredients that gave each iced coffee it’s unique but tasty flavor. I put a lid on the jar and set it in the refrigerator until it was cold (that way the ice didn’t melt when I poured the coffee over ice). I’ve left the coffee in the refrigerator for up to 3 days. 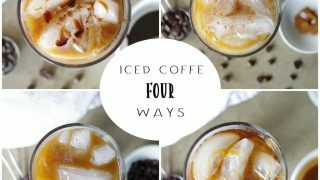 Making iced coffee four ways has saved me time from going to the coffee shop, money, and I can make it exactly the way I like it. I hope one of these iced coffee recipes works for you. If you can have dairy, feel free to use your dairy of choice. Stop back by and let me know which one is your favorite! For each iced coffee flavor, pour warm or hot coffee into a tall glass or jar. Add remaining ingredients (except the dairy-free milk). Cover and refrigerate until ready to use (up to 4 days). Pour in coconut milk (or dairy, or dairy milk of choice). 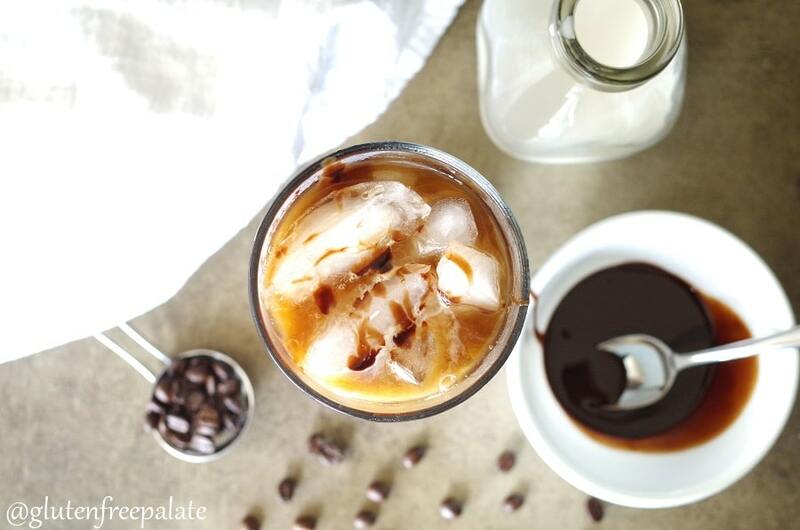 I LOVE that you made an iced coffee recipe round that is dairy-free! I can consume dairy, but I appreciate these types of recipes that I can share with my friends who can’t consume dairy. I’ve never been a huge coffee fan, but the iced coffee always felt like a different category. These looks like a fabulous treat! These look like such fun summer drinks! I should make one for my husband – he’s the coffee lover in our little family. It’s after 10 & I’m drinking a regular coffee, so this post has my name all over it! I may just have try the caramel version in the morning. Looks delish! Do you use coconut cream from the can? Or is it a coconut ‘creamer’ that you used? Thanks! Thank you! I’ve actually used both. If I use the coconut creamer, I don’t put in coconut sugar/honey. I’ve also used coconut milk. Wow, this looks yummy and perfect for the summer season. I will try it sure for my father because he is a coffee freak. Hope so my father loves this. I hope he likes these coffee recipes too!